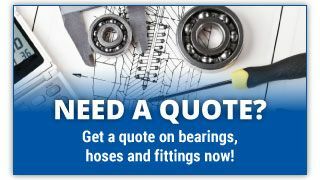 Red Deer | Products| Progressive Bearing & Hydraulic Ltd.
No matter what you need, come and see Progressive Bearing & Hydraulic Ltd. today. Located in Red Deer, we supply a huge range of industrial products for all sorts of applications. We stock a varied assortment of bearings including needle, spherical, rod end, ball, roller and many, many more. We also have a great stock of hoses and fittings, as well as electric motors. If you don’t see what you need on our products pages, be sure to give us a call or drop us a line and we’ll be happy to help you out.